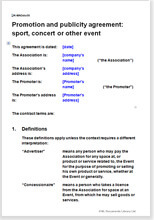 This agreement provides a complete framework from which you can construct your promoters agreement. Your counter party may be in the Republic of South Africa or anywhere else. This agreement is essentially a marketing agreement. You “own” an event or the right to promote an event. Your event could be a local football tournament, a children’s choir competition, a pop concert, or an air show. You may be a company, the head of a sports body or a private individual. Your event could take place over one day or many weeks. You want someone to take care of the marketing and promotion of that event or series of events. The promoter you engage may be a large marketing organisation or a single experienced professional. This promotion and publicity agreement provides for your expert to take over just as much of the marketing as you wish. It is not about “all or nothing”. It covers tasks from liaison with the local paper to negotiating licences for the people who sell food and drink to your visitors. We have given you some ideas about how to base the payment, but every deal is different, so we have also provided for the money deal to be written by you and placed in a schedule. Net Lawman documents always provide the skeleton of the commercial arrangement and not merely the “lawyers’ terms” your solicitor might suggest.